Mens Striped Trousers Odyssey by Punkrave. These mens striped trousers are the eccentric statement pants with classic details. Featuring dark brown and rust orange vertical-striped dress pants with rich wool blend accents. Constructed with front pockets, rear welt pockets, and button and zipper fly. Mens striped trousers designed with skinny belt buckle attached on rear waistband. Belt attachment includes five notches to easily loosen or tighten garment’s waistline. Made with vintage-inspired brass hardware with intricate engravings on fly button and belt buckle. 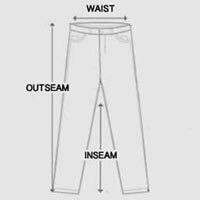 Mid-rise, slim fit pants with slight stretch for a fitted and comfortable leg cut. Wear fashion that’ll take you places in these brown mens striped trousers. Complement pants with matching striped vest (sold separately). See vests for more.